With so many dystopian novels filling our middle school shelves beyond capacity, I had reached my limit. Sure, I enjoy the what-if nature of most of these novels, but many began to feel like the same story simply being retold. Then I read the summary of Karen Thompson Walker’s The Age of Miracles and my curiosity was piqued. Yet, I still wondered whether the novel would define itself, rather than follow the same worn-out path. Walker’s novel, thankfully, goes where the others have not. The story begins like any ordinary day in an eleven-year-old girl’s life. Julia, Walker’s protagonist and narrator, has just awoken from a sleepover with her best friend, Hanna. Her father is seated at the dining room table, meticulously reading the newspaper. Her mother is headed home with bagels. The typical Saturday events are in motion. However, when Julia’s mother breathlessly enters the house and demands that the television news be turned on, readers know something is wrong. This is where Walker’s premise – what happens when the Earth’s rotation slows down? – begins to reveal itself. And, this is where her novel differentiates itself. 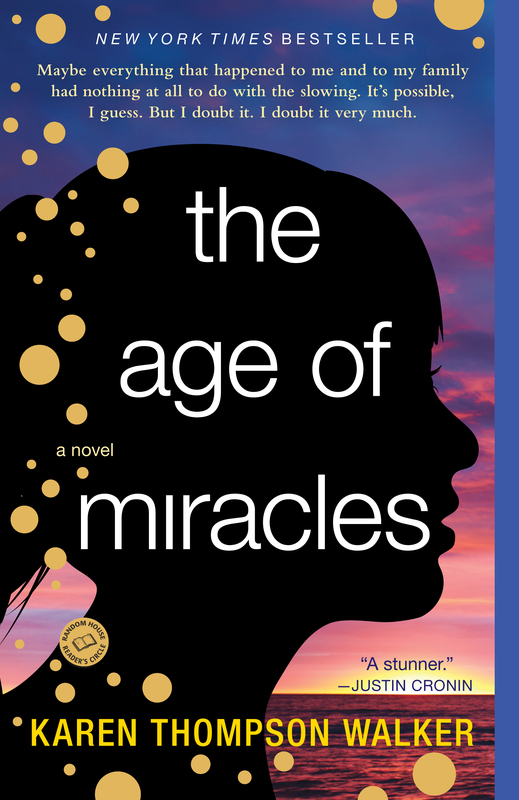 While most young adult dystopian novels focus on the aftermath of a cataclysmic event, The Age of Miracles guides you along from the beginning. This novel is also different because while the Earth’s slowing should be the primary focus, it shares time with Julia’s observations of her parents disintegrating relationship and her own social troubles. The “slowing” began when Julia was 11. However, she tells the story as a twenty-something, looking back, and at times making sense, of the events – social, societal, and scientific – that unfolded during those first few months, when the normal 24-hour day extended itself to 72 hours. With all of the tumult surrounding her, Julia’s primary concern, fitting in, plays out against the uncertainty of Earth’s future. The Age of Miracles is a novel I could have happily continued reading for hundreds more pages. That’s the sign of a truly wonderful story.